A better burger from Distilled. Photo by William Gaines. HEAD’S UP: Welcome to a Food Network NYC Wine & Food Festival edition of Chow Talk. There were ample morsels to chew on during the nearly four full days to merit an entire column. So here goes. Bon appetit! 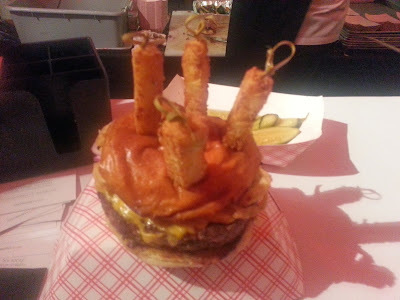 REGARDLESS of the judges’ or voting public’s wrong-headed ideas, the best burger at the Blue Moon Burger Bash during last week's Food Network NYC Wine & Food Festival’s was the Shane Lyons creation that he dishes out at Distilled. It was extremely juicy. And so was the Distilled hospitality, which is just how they roll down yonder. That is, in the Tribeca section of Manhattan where the several-months-young “New American Public House” is ensconced (http://www.DistilledNY.com/) ... More shortly. Visit http://www.nycwff.org/ to learn more about the Food Network Wine & Food Festival 2013.